Arsenal moved into the Premier League top four with a win that left bottom club Leicester City five points adrift of safety. Mesut Ozil whipped in a corner for Laurent Koscielny to tap in from close range and later saw a shot saved, allowing Theo Walcott to volley home. But the Foxes rallied as Andrej Kramaric scored a first goal in English football with a low second-half shot. He was also denied late on by keeper David Ospina as the Gunners held on. It has been an eventful four days at Leicester, who were promoted from the Championship in May. On Sunday, the club issued a statement denying widespread reports manager Nigel Pearson had been sacked and before kick-off he discovered he would not be charged for an apparent touchline grapple with James McArthur during Saturday's defeat by Crystal Palace. The 51-year-old sat in the stands for the opening period and joked with club owner Vichai Srivaddhanaprabha, but the harsh reality that Leicester have been bottom for over two months will escape neither man. Pearson deployed a rarely used back five to frustrate Arsenal and while his side threatened until the final whistle, the Gunners' quality in the final third - not least from Ozil, who completed 88% of his passes - was telling. The German - making his 50th start - created an early opening for Walcott, saw a poked shot tipped wide and from the resulting corner, delivered for Koscielny to score his third goal of the season. The French defender had ample space to side-foot in, ensuring Pearson's side remain on just four clean sheets this season - a league low. Alexis Sanchez - back after a hamstring injury - had shots blocked but when Ozil found the target from range, Mark Schwarzer parried and Walcott swept home a crisp first-time volley from 12 yards across the keeper. Arsenal boss Arsene Wenger lost substitute Aaron Ramsey to injury after just nine minutes of his introduction as they stuttered through the second period and Kramaric will rue his chance to deliver the point his side's endeavour arguably deserved. He squeezed a shot through bodies and low into the net to give Leicester some hope and when sent clear late on by the impressive Riyad Mahrez - who went close four times on the night - could only chip into the hands of Ospina. It was a glorious chance and the difference between a crucial away point and Arsenal displacing Manchester United in the top four. Ben Hamer (Leicester City) is shown the yellow card. 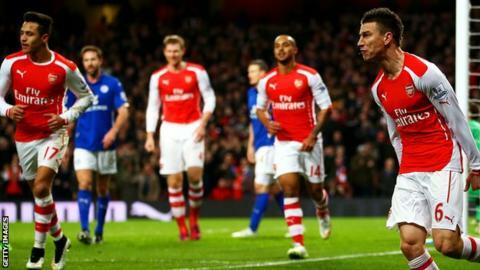 Second Half ends, Arsenal 2, Leicester City 1. Olivier Giroud (Arsenal) is shown the yellow card for a bad foul. Mark Schwarzer (Leicester City) wins a free kick in the defensive half. Offside, Leicester City. Riyad Mahrez tries a through ball, but Leonardo Ulloa is caught offside. Hand ball by Olivier Giroud (Arsenal). Attempt blocked. Mathieu Flamini (Arsenal) right footed shot from outside the box is blocked. Assisted by Olivier Giroud with a headed pass. Foul by Matthew James (Leicester City). Substitution, Leicester City. David Nugent replaces Jeffrey Schlupp. Hand ball by Mathieu Flamini (Arsenal). Substitution, Arsenal. Mathieu Flamini replaces Aaron Ramsey because of an injury. Substitution, Leicester City. Leonardo Ulloa replaces Wes Morgan. Attempt saved. Andrej Kramaric (Leicester City) right footed shot from the right side of the box is saved in the centre of the goal. Assisted by Riyad Mahrez. Attempt blocked. Francis Coquelin (Arsenal) right footed shot from outside the box is blocked. Corner, Arsenal. Conceded by Esteban Cambiasso. Attempt blocked. Aaron Ramsey (Arsenal) right footed shot from a difficult angle on the left is blocked. Assisted by Laurent Koscielny with a headed pass. Corner, Arsenal. Conceded by Wes Morgan. Jeffrey Schlupp (Leicester City) wins a free kick in the attacking half. Substitution, Arsenal. Aaron Ramsey replaces Theo Walcott. Attempt missed. Riyad Mahrez (Leicester City) left footed shot from outside the box is close, but misses to the left.